El Sacoman or The Sack Man (also called the Bag Man or Man with the Bag/Sack) is a figure similar to the bogeyman, portrayed as a man with a sack on his back who carries naughty children away. Variants of this figure appear in many Latin countries, such as Spain, Portugal, Brazil and the countries of Spanish America, where it referred to as el "Hombre del costal", el hombre del saco, or in Portuguese, o homem do saco (all of which mean "the sack/bag man"), and also in Eastern Europe, Haiti and some countries in Asia. 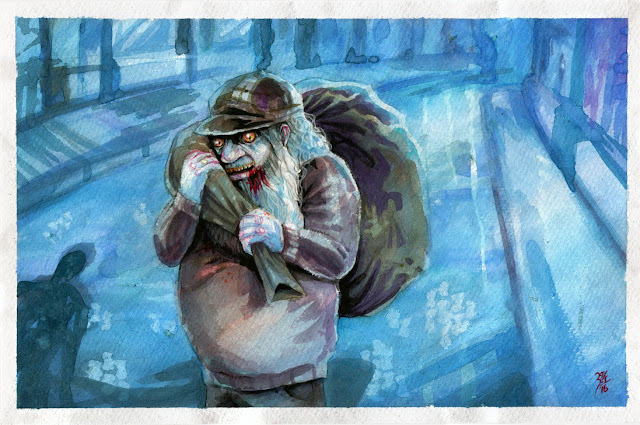 The "Sack Man" is envisioned as an impossibly ugly and skinny old man carrying a large sack who wanders the land searching for "naughty" children - whom he is said to capture and stuff in his bag before spiriting them away to a grisly fate (many tales say that the "Sack Man" eats his young victims).The character is not considered as a mythical creature by children.Instead,he is recognized as an insane psychotic murderer that has been accepted by Society. The "Sack Man" was likely inspired by a very real man who, during the 16th and 17th centuries, was in charge of collecting orphan babies in order to take them to the orphanages: he would put them in a huge bag or in wicker baskets, and carry them all through the province collecting more children. Most of them usually died before reaching the orphanage due to the lack of care and the obviously insalubrious conditions in which he transported them: the lingering memory of this figure may well have inspired the bogeyman as envisioned in modern lore. In Spain in 1910, a seven-year-old boy was kidnapped to be used as a cure for Francisco Ortega’s tuberculosis. Ortega had been told by a local healer that he could rid himself of the disease by drinking the blood of a child and applying a hot poultice made from the child’s fat on his chest. For a large sum of money, the healer drugged the boy and put him in a sack. He was killed and used as prescribed. Ortega and the healer were both executed.